Elizabeth Storey (known as ‘Lizzie’) was the servant-girl and companion to an old lady who lived in a remote farmhouse about 10 miles from Hexham. During snowy weather on the 24th October 1868, Lizzie and her mistress were roused from sleep by sounds from the dairy. Lizzie took up a broom and started a search of the house only to be confronted by a masked man. Lizzie was attacked but fought him off. He took up a scythe from the dairy floor to kill her and delivered a brutal cut to Lizzie’s hand. Lizzie threw herself upon the attacker who dropped the scythe but grabbed her by the hair, striking her cruelly and pulling her across the floor. She shouted to her mistress to “Get the scissors and cut my hair!” in order to free herself (see illustration below). She struggled free, attacked the man again and ripped his mask off so that she could “know him again”. 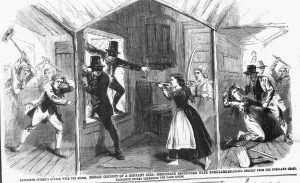 At this point, another masked assailant jumped through the window, but Lizzie took up an old flint-lock gun and pulled the trigger. The shot misfired but she grabbed a poker instead and set about the men with such ferocity that they fled. One man was captured at Annfield Plain, whilst the other lurked in the vicinity of the farmhouse, waiting to get his revenge on Lizzie. Fortunately, he was apprehended and handcuffed by Sergt. Young of the Northumberland Constabulary, but the robber overpowered the policeman and escaped, only to be recaptured and conveyed to Hexham’s lock-up (probably the House of Correction) on the 9th December. Both men were later sentenced to fifteen years penal servitude. 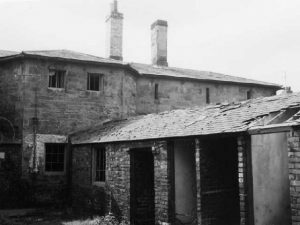 The House of Correction, Hexham, as it looked in the mid-20th century. And crown our dauntless heroine the Queen of Victory.